Hey everyone, this is going to be a lengthy post about upcoming changes to all of our content; comics, podcasts, streams and even offline community events. If you want the TLDR; version you may skip to the bottom of the post. Thank you as always for being a fan and keeping us employed making content full-time. 6 months ago we made drastic changes to our content; specifically our streams. We beefed up our live schedule to 6 days a week, went from Variety to streaming Fallout76 + MTGA as our main content and, unintentionally, worked less on our comics and podcasts. We saw success at first, but the thing about true data and finding out what works is giving it time, and 3 months later we found our Fallout content was just not working. So, sticking with the idea of not doing variety anymore, we switched to FFXIV and Division 2. We made a D2 Clan, a FF Free company, and have been doing our best to build in those communities. Our most recent development has been switching from 8 hour straight streams to two 4 hours streams, MTGA during the day and FF/D2 at night. And now, 6 months later, we have come to this conclusion; Twitch cannot carry our content. In reducing time we need to make comics, podcast and commissions, we as a business have been suffering tremendously in fan and financial growth. For those of you who have stayed with us on this journey, we are incredibly thankful, and we are making what we hope is the last live schedule change for the forseeable future. Let’s start with Twitch, which has been the big decider in all of this. Currently, we have been streaming Mon, Wed-Fri 12pm-4pm for MTGA, Tuesday 8pm-12am for Last Light, and Wed-Fri 7pm-11pm for our Co-Op Games. Lets not forget Sub Sundays 6pm-8pm. Basically, we are no longer streaming Monday and Thursday nights. And, Sub Sunday will be in the early afternoon. Lets talk about what this means for our other content; we get to catch up. For fans of our comics and podcasts you’ll noticed Beelzebud and Starminis haven’t updated since October, and Drunk Fandom S2 is 3 months late. This was never intended, and was a product of trying to push Twitch as a main source of income and ultimately has been making it harder for us in every way possible, including financial growth. Basically, right now in terms of keeping us financially stable, Twitch is our lowest income provider. I know finances are a delicate topic, but to put it best it is purely inconsistent income. Subs, bits, donations, are all unpredictable means of surviving as full time creators and as an affiliate we do not earn any ad/views revenue. 6 months ago we doubled the amount of time we stream, but saw little to no financial growth in doing so. So its not that it doesn’t help us at all, all your contributions matter immensely, but the amount of time we are putting in is not equating what we are getting out of it. On top of all of this, taxes destroyed us this year, so we are now putting %20 of our income in a savings account every commission/payment, which means we are making even less now. Our comics, on the other hand, earn us ad revenue. So, with our new schedule we now have the means to double comic production and double the income generated from them! We hope that not only will we catch up on Beelzebud and StarMinis, but we want to start posting 2-3 DungeonMinis a week. More comics means more revenue, more exposure to get new fans and more laughs. Its good for us, and good for you! Finally, lets talk Games. 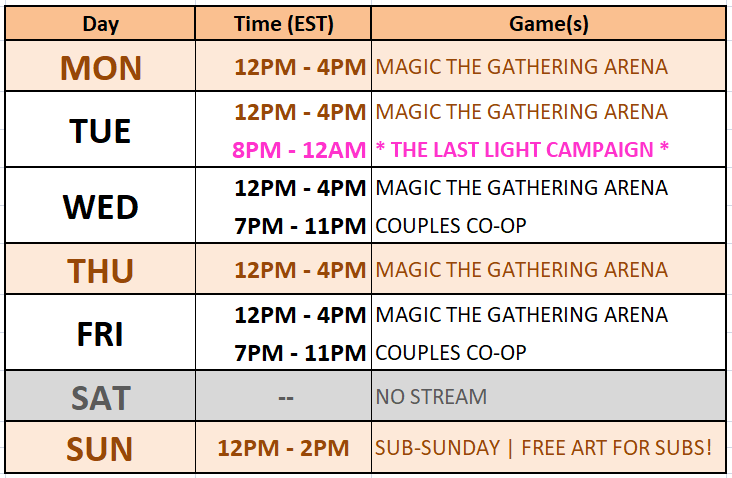 With our schedule changes MTGA is staying the same but our couple co-op nights are down to 2-3 days a week (If Last Light gets cancelled for anything we’ll play games instead that night) our current plan is to focus on Division 2 streams. We’re still going to try to push non-variety, but right now D2 is fresh and is getting new content updates rapidly enough for us to push building our clan and an audience there. This means there will be no FFXIV streams for a while. BUT fear not our Free Company and FF friends, for we are not abandoning the game. Just for now, we will be focusing on off stream content. We’re going to start scheduling weekly game events/raids while also pushing ourselves to cap for the expansion. We want to start introducing Sub rewards like guild housing and other perks. Basically, Depending on how well Division 2 does will determine if we switch it up or not for our on-stream gaming. If D2 borks, we’re gonna push FFXIV, if FFXIV borks, we may even change back to variety streaming cause, honestly? Our RE2 and BotW co-op streams are currently our most popular stream nights we had in months. Thank you so much for all your love and support, and understanding of these new changes. We think in the long run, this is going to help sustain/grow us more, and we think you’ll like whats to come from the Fierce Ferrets.